To legally take tax exempt donations for your organization you have to apply for, and be approved for, 501(c)3 exemption status with the Internal Revenue Service. If you do not have 501(c)3 exemption status, legally any donations you receive are taxable to you or to your organization if the donation was made out to your association. This money must be claimed as a part of your income on your federal and state (if applicable) tax returns. Furthermore, the donation is not tax deductible for the giver of the donation if you are not approved for 501(c)3 exemption status. Determine your general eligibility to apply for recognition of 501(c)3 tax exemption status. Your organization must operate exclusively for one of the following purposes: charity, religion, literary or education, prevention of cruelty to children or animals, scientific research, or national or international sports competition. If the sole purpose of your organization does not fall into one of these categories, it does not meet the standards of a qualified charity and is not eligible for 501(c)3 tax exemption status. Set up a trust, corporation or unincorporated association. This is necessary in order to apply for 501(c)3 exemption status. Each state has different rules relating to how to set up each of these types of organizations. Refer to the resources offered by your state’s Secretary of State office and Department of Financial Institutions for more information on what is required to set up these types of organizations in your state. Use the “EIN Assistant” tool on the IRS website to apply for an Employee Identification Number for your organization. An EIN number is required to apply for 501(c)3 exemption status. Fill out IRS Form 1023 or Form 1024. Both are referred to as the Application for Recognition of Exemption. The form you need to fill out depends upon the description of your qualified organization. Refer to the “Organization Reference Chart” publication on the IRS website to determine which application you need to fill out. Gather the required supporting documents that must be submitted with your application. For example, you must submit copies of your articles of incorporation, articles of association or trust indenture along with your Application for Recognition of Exemption. You must also include financial statements which show your organization’s expenditures for the past one to four years, or a proposed budget for the next two accounting periods if your organization is a start-up. The IRS will review your application and will respond via snail mail to inform you that the application has been received and is being reviewed. If approved, you can legally accept tax exempt donations, and your donators can claim their donation as a tax deduction on Schedule A of their income tax return. Austen, Maya. 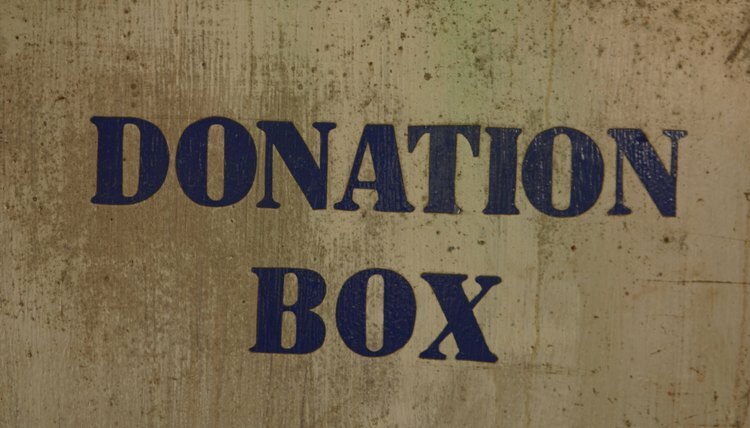 "How to Legally Take Donations." , https://legalbeagle.com/12191791-legally-donations.html. Accessed 18 April 2019.